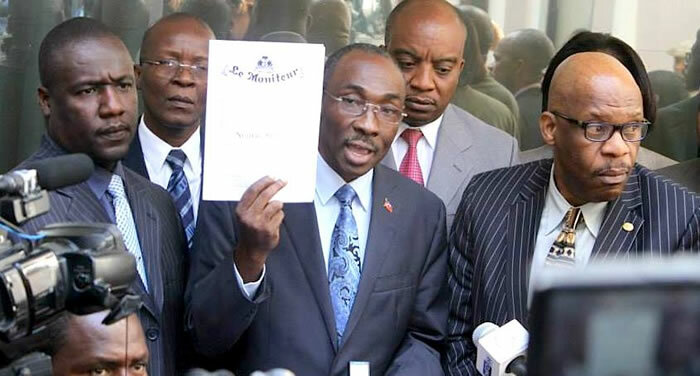 On Mar 4, 2015, the Haitian Prime Minister, Evans Paul accompanied by Minister of Justice and Minister Delegate to the Prime Minister for electoral matters, went to the headquarters of the Provisional Electoral Council (CEP) and there he symbolically delivered a copy of the official newspaper "Le Moniteur" which has published two decrees relating to the holding of the long delayed election during 2015. The first decree relates to the administration process of the election and second decree is about the amendment of National Identification (CIN) dated June 1, 2005, which states that the validity of National Identification Cards (CIN) issued over the years 2005, 2006 and 2007, would be extended till 31 December 2017 instead of 2015. He has also stated that the government is determined to hold this election within 2015, overcoming every obstacle for lack of legal framework. The executives and the stakeholders have made considerable effort to prepare this consensus decree in 244 articles divided into 18 chapters and has a total of 382 provisions.